The picture is taken at the 2003 Nationals. A rare mare from a very successful family, both regarding performance and shows. She is full sister to *Bayona, 3/4 sister to Aziz and half sister to Fadlak (sire of Eyd Fazushka) and *Melisande. 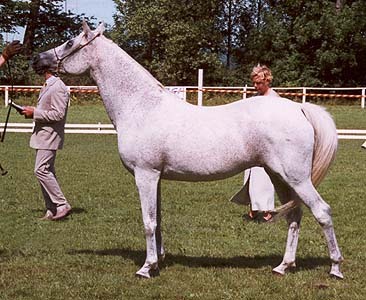 Ayora is the dam of the performance stallion Aydin by Rousseau. Ayora belongs to the mare line of Rodania OA ca 1869. She was bred by the Ruala bedouins and imported to Crabbet in 1881. At Crabbet she founded a very valuable family which is widely spread around the world. The branch Ayora comes from is that of Riyala 1905, dam of Razina 1922 who was one of the best mares at Hanstead. Razina's greatgranddaughter Yateemah (Blue Domino x *Salinas) was imp SWE and founded a very valuable family. However, before leaving England she produced the mare Cinders. That mare would become the granddam of *Odessa, dam of *Padron. In Sweden Yateemah produced *Ayscha who was the only non-polish daughter of *Exelsjor in Sweden. *Ayscha was a broodmare supreme and produced the stallions Aziz and Fadlak and the mares Shahika, Nadjiba, *Bayona and *Melisande. Her descendants are beautiful but they also excel at performance, for example the stallion Aziz who qualified to the National showjumping finals for junior horses among other breeds!